(3) the ability of the agent to see herself as a morally responsible person. Nelson uses this analysis to argue that oppressive narratives can reduce one's normative competence and thus reduce one's freedom. Nelson endorses the importance of narrative in ethics as argued for by philosophers such as Martha Nussbaum, Michael DePaul, Richard Rorty, Alisdair McIntyre and Charles Taylor. However, she also has some criticisms and suggestions for how to improve their ideas. She argues that those philosophers have presented a narrow conception of the role of narrative in moral life, focusing on sophisticated literary texts, well-respected social roles, or quest narratives. She suggests that people can also make use of narrative in their moral lives through constructing counterstories. In addition to ethics, Nelson addresses the nature of the self, arguing that personal identities are constructed through narrative. Here she draws on the work of Marya Schechtman in The Constitution of Selves, and refers also to the philosophers Harry Frankfurt, Christine Korsgaard, and Iris Marion Young, among others. She discusses the constraints on the kinds of stories that can constitute an identity, and to what extent an individual has the power to create herself. Nelson's remarks are somewhat programmatic rather than offering a whole theory, since her main interest is in the importance of counterstories in shaping one's own self. As she summarizes her conclusion, "personal identities are complicated narrative constructions consisting of a fluid and continual interaction of the many stories and fragments of stories that are created around the things that seem most important, from either the first- or the third-person perspective, about a person's life over time." With this conception of identity, Nelson is able to provide an account of how oppression can damage the self. She explains the role of exploitation, marginalization, powerlessness, cultural imperialism, and violence. She also goes into some detail in examining the cases of gypsies, transsexuals, and mothers. In each case, she spells out the ways that the standard narratives concerning these groups serve to oppress them and reduce their freedom. For example, she sets out what she calls the "Clinically Correct" story, which is the "master narrative" about transsexuals. It says that there are just two sexes, male and female, and there are two genders, masculine and feminine. According to this story, transsexuals have always felt that they were trapped in the wrong body, but since they can never achieve a perfectly transformed body through medical procedures, they can never become real men or women, and inevitably at best can only try to pass as male or female. Nelson argues that this treats transsexualism as a birth defect and leaves transsexuals with only an incoherent and morally degrading story to tell about themselves. Nelson finishes with an extended discussion of counterstories, which resist the pressures of master narratives. Since master narratives are so powerful and quash opposing views, counterstories need to themselves be strong and to exploit weaknesses in master narratives in order to help oppressed groups. Nelson spells out some of the ways in which counterstories are able to overcome master narratives, and she also explains how counterstories can fail. 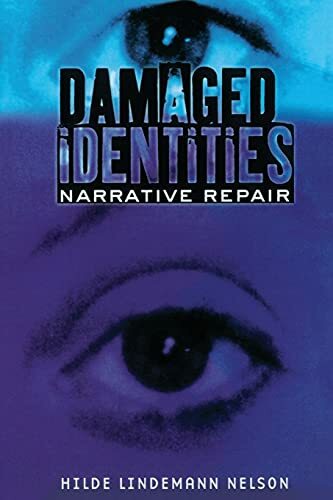 Damaged Identities is an original piece of work that deserves attention from philosophers and social theorists. There are, however, a number of questions it raises. A central issue that it is largely silent about is the relation of master narratives to other methods of oppression such as legal exclusion, poverty, and violence. Reading Nelson, one is reminded of the French structuralist theory that reduces all of human life to discourse and text. While the focus on narratives may have explanatory value, it is implausible that one can understand narratives in isolation from these other forces that have been discussed at length in other discussions of class systems, racism, sexism, and homophobia. Furthermore, it is not clear how narratives relate to stereotypes, degrading visual images. Nelson also does not spell out how her narrative theory and the concept of counterstories relate to psychological theories of self-esteem, the importance of role models, and the main psychodynamic theories of the twentieth century. One is left wondering whether Nelson's account is an alternative approach to these others, or whether it is instead simply a different conceptualization and synthesis of familiar ideas. Many philosophers, psychoanalytic theorists and especially literary theorists have enthusiastically defended the importance of narrative in understanding human life. Others have raised concerns about the explanatory value of the idea. Possibly the central worry here is that the concept of narrative is itself so vague and open to diverse interpretations that different "narrative theories" are in fact addressing widely disparate issues and cannot be profitably compared with each other. This worry is increased by Nelson's use of the term "identity," which is clearly very different from that used in analytic philosophy. While Nelson argues that narratives constitute identity, it seems that she means that narratives influence people's self-image. Indeed, it is not clear that Nelson makes a clear distinction between self and beliefs about oneself, which is an essential distinction for any careful discussion of the nature of identity. Issues such as this will probably mean that philosophers familiar with the debate over the nature of personal identity will be unsatisfied by Nelson's approach. Nevertheless, Nelson makes a strong case that the concept of narrative is an important one in understanding oppression. It could be especially useful in understanding the way that stigma operates keeping people with disabilities and chronic illnesses marginalized from the mainstream of society, and this is a topic that deserves a great deal of attention. Despite its problems, Damaged Identities has the potential to be an important part of a future research program on the way that narratives shape our lives, and other philosophers could do useful work by refining and improving on Nelson's approach.